This summer I'd like all of my students to work on a music workbook of some sort to brush up on their understanding of musical notation. I know I go over a lot of this information during lessons with note reading, group lessons, etc. but sometimes I wonder how much they are really comprehending it all. I was somewhat shocked when my 10 year old Book 7 daughter didn't understand some very basic music theory - yet she can play - and even note read quite well. So, it's been my quest to find the theory workbook that is perfect for my students. I haven't found the perfect one yet and even would like to publish my own someday. However, I don't have the time for that right now so I've purchased several theory workbooks and have compared them. Hopefully my comparison will help you make a choice which would be good for your child or students. One hard part about finding the perfect music theory workbook is that ability and age both play a factor in what a child can understand. Right now I have three 1st grade boy students who are twinklers and at the beginning of Book 1. I also have four 9-12 year old girls at the end of Book 1. These two groups of students cannot use the same workbook, in my opinion. Even though they are all in book 1 their age plays a major factor in what they can comprehend. 1st graders are just barely learning how to read and write and know basic arithmetic. 4th, 5th, and 6th graders can read and comprehend much more and their writing skills are much more advanced. They understand much more math and abstract concepts and therefor can work in a more advanced book. I also want these books to be informative and fun and not completely over their heads. I really don't want these books to "teach" new concepts, but rather reinforce everything that I am teaching during lessons and group class. So, here are the different theory books that I have purchased. I plan to have each of my students do a different book (with some exceptions) because I don't know if I can totally grasp how effective they are until a real child is actually doing the workbook. Junior Musicianship System and Music Theory Books 1 and 2 from The Fun Music Co. 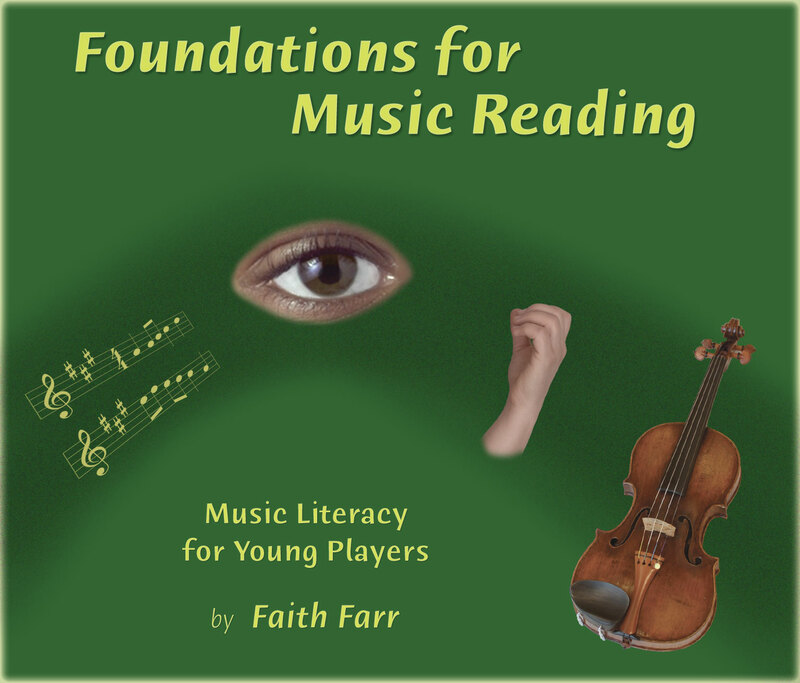 Foundations for Music Reading 1, 2 and 3 by Faith Farr published by Farr Publications. Junior Musicianship System and Music Theory Books 1 and 2 from The Fun Music Company. This set of music theory books come as a digital copy. Individually the Junior Musicianship costs $49.95 and the Theory Books cost $59.95 each. Together you can buy the Junior Musicianship, Theory Books 1 and 2, plus several other fun and informative worksheets for $99.00. This gives you A LOT of worksheets and you have full printing rights after purchase for the rest of your life. There is also a Theory book 3 and 4 that I didn't purchase. *Large Print Manuscript designed just for little fingers and thick pencils or markers. *One concept per worksheet so that they can focus on one thing and retain it. *Very few words Preschool children usually havn’t learned how to read yet! *Over 200 Worksheets including some designed especially for teaching violin. *Has Pitch, Rhythm, and Symbols worksheets. What I like: It's the most basic set of theory worksheets I've found. You can pick and choose which worksheets to give out. Some of the ones that aren't violin are more geared toward piano, but my preschooler will have fun working on several of these each day. What I don't like: Can I say that there are too many worksheets? I used up tons of printer ink to print them. I wish there were more "fun" pages instead of just writing notes on the staff. 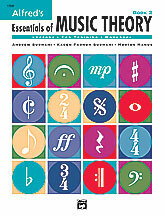 Music Theory Books 1 (48 pgs) and 2 (58 pgs) is a very comprehensive theory course. *Comprehensive self-checking material to cover all aspects of music theory teaching. *Flexibility in printing so you can print what you need, when you need it. *Access to support so that If there’s a topic in music theory for the level that you see has not covered, then you can request it and it will be generated for you within seven days. *Includes assessments, multiple choice quizzes and even a completion exam for each level. What I like: It's very comprehensive. It's a bit expensive with up-front costs, but I like that I can have it forever and print it for any students I want in the future. The second book is a good review of the first plus added material so it would be good to give an older student who has never done a theory workbook before. What I don't like: I wish there were more "fun" pages and review of past concepts. It gives a concept and a few exercises and moves on. ADDED BONUS: The Fun Music Company has so way fun and unique "fun" theory games that you can purchase at additional cost. I'm keeping a close eye out because they come up with new ones every so often. Ones that I like are Printable Music Games, Treasure Island Games, Music Symbol Code Breakers, and Musical Terms for the Digital Age. You can get some of these in the $99 package deal. I am wishy washy about this book. It really gives a thorough approach to the names of notes, finger patterns, scales, key signatures, but not other topics as much. It's specific toward string instruments, particularly violin. The second book really goes into detail about key signatures, scales, and finger patterns. What I like: it's very thorough for the information presented. I think it would be good for an older beginner (at least Book 2) who just needs a better understanding of the fingerboard. Book 2 would be better for Book 4 or older. What I don't like: It doesn't give a broad view of other theory subjects. It's a very "boring" looking book. 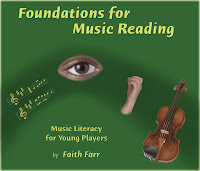 This book is used in conjunction with Foundations for Music Theory (look below.) Because of this, I think it would be a good companion with this other book. I don't think you can buy this book. It was given to me by another teacher years ago and I've used it on and off. The concepts are presented creatively and gives an overview of most of the major concepts for theory. It's not very long. When I used it in the past I would go over a concept at each lesson and they would do the worksheet for that concept. Book 1 is good for Suzuki book 2 and Book 2 is good for Suzuki Book 3 or 4. It's only 24 pages. I'm giving this book to my older students who I know are really busy during the summer. What I like: The pages are fun and creative at presenting the topics. What I don't like: It presents a concept once and moves on. Even each activity for the subject isn't very long. If a child doesn't understand it there isn't much reinforcement. I was so excited for these books because they had a lot of pages so I knew it wouldn't just be an overview. However, it's so repetitive and (am I being blunt?) Boring! I'm interested to see how a student will do with these books because it's pages and pages of writing the same notes over and over. So, in that respect it gives a lot of repetition, but I kind of think of it like pages and pages of writing the alphabet. It is very simple and doesn't have many activities. Book 3 gives a VERY thorough approach to note names and key signatures. What I like: It's not just a brief overview. A child will know their stuff by the end. The first book is very simple. By Book 3 it is more difficult. It's hard to say what age and Suzuki level, yet. I'll update when I have more experience. What I don't like: I think it looks boring and too repetitive. I also think it's a bit expensive. This is a great book that covers a lot of information in a little amount of space. It's available for piano, violin, viola, cello, and guitar. In my opinion the price is right and it has fun little activities for each page...I wish it had more. However, I just found that the same company has little "mini activity books" for sale as well for $3.75. They are 16 pages each. Cost of each book: $8.95 and they are each 25 pages. What I like: They are very thorough, but not too difficult. Each page gives several explanations and review of previous material plus a little activity. Comes in 4 volumes so it could easily be used over a period of 4 years. What I don't like: I wish it were longer. I wish it had more activities, but the "mini book" might solve that problem. This is a book meant for school music classes. It's non-instrument specific. The price is good and I was doubly happy when I realized that they are reproducible !! That means I don't ever have to buy it again for my students - I can only charge for the copying. I love that! Book 1 is extremely simple. This is one step up from the Junior Musicianship above. I am giving this one to my three 1st grade boys. Book 3 gives a brief explanation of chords and major/minor scales, but it's not too complicated. Cost: $6.95 per book, 40-46 pages. REPRODUCIBLE! What I like: The first book has really big writing which is good for little hands. It's basic, but gives good explanation of the concept. There is also an activity workbook that I don't have, yet. I'm waiting for that in the mail! What I don't like: Can they PLEASE get someone who LOOKS like they can play the violin on the front cover! Also, it's not violin specific, which I want. This is a well-known theory book. It's laid out very well and gives one of the best overviews of them all (it's very similar to the Fun Music Company theory books.) There is also a book for activities that you can buy that is REPRODUCIBLE. It's not violin specific, but I know they have an alto clef version for viola. It introduces bass clef and the grand staff, but the majority of the exercises are in the treble clef. To me this is okay for a more advanced student. They should have a bit of background on the other clefs. Book 2 is a direct companion with the first book, not reviewing any information - just going on. Book 3 goes into detail about triads, 7th chords, figured bass, and chord progression. It's way too advanced for what I want to teach. What I like: Book 1 is a great overview - one of the best. The companion activity book gives fun worksheets to do. This book would probably be good for young Book 4 students and above. Book 2 is more difficult, but is a good companion to the second. I'm not even going to get into Book 3 with my students. What I don't like: It isn't violin specific. It also is a lot like a text book. Alfred has a lot of companion material for these books including software and teaching materials. This is the only book I've actually had experience with because my daughter's teacher had her do it last summer. She was 9 and in Book 6. She is also very intelligent. She zipped through the first part of the book, but the second half of the book got into details about triads and scales and I had to work with her on it. I would suggest this book for Book 4 and above and at least 9 years old, but probably a bit older. Don't let the "beginners" in the title fool you. It has a second book that I haven't seen. I don't know how advanced it gets. What I like: Has lots of exercises and repetitions. A good book for the more advanced student. What I didn't like: Not really fun and creative. I wasn't going to get this book but it had great reviews online and it wasn't very expensive. It's a good little workbook for a summer project like mine. It has activities and briefly explains major concepts. I don't have Book 2 yet, but I really like Book 1. What I like: It's inexpensive, violin specific, and has the keyboard for some activities (violinists still need to know about the keyboard.) I think this is great for understanding a lot of theory. What I don't like: I wish it were longer and more thorough. I was so excited to get these books in the mail the other day. They are big books and at first glance has a lot of material. I think these were created by a Suzuki teacher so it has lots of repetitions and review. It also uses many different ways to learn: aural, verbal, tactile, kinesthetic, and written. What I like: I think this is such a well-rounded approach to learning. It's the basics, but goes into details. It has activities, challenges, and sections where the children have to "create" so they are applying their knowledge. What I don't like: Unfortunately, this is one of my favorites, but has the biggest drawback! To really make this a great book you have to get the "supplemantal material" which is Fink, Quick steps to Note Reading Books 1 and 2, Perkins, Logical approach to Rhythmic Notation Book 1, and Etling, Workbook for Strings (described above). So, I have to get 4 more books to really make this book useful! That bothers me because this is a pretty expensive book (naturally because it has so many pages) but in order for it to be "worth it" (in my mind) I need to buy four more books. What!! I've looked through this book and it does seem like you can do it without the supplemental books, but you're missing half of the exercises. As a teacher I could tweek it and do the same type of exercises in other books, but I don't have the time to tweek a whole book for each student. This is my biggest frustration with this book. I can find good things about all of these books, but none of them are exactly what I want. I want a 60-75 page book that is less than $15 that has several volumes (is 8 to much to ask for?) with several ability levels. I'd like it to cover all of the material in Alfred's theory book, but have fun and creative exercises and worksheets. I'd like it to use the multiple learning approach like the Farr books, but have it be a unit all in itself that I can hand out yearly to my students and they can enjoy doing each summer. ...I guess I'll just have to make my own someday....check back in 10 years. Perhaps it's good that I have all of these books because each student has his/her own needs. 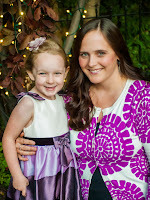 I'm going to have my 3 year old twinkle do the Junior Musicianship series. I'm going to have two of my young Book 1 students do the Let's Learn Music book 1. I'm going to have my other young Book 1 student do the Just the Facts Primer. My older, late book 1 students will be doing Let's Learn Music book 2, Beginner Violin Theory 1, All for Strings 1, and Notes for Strings 1. My Book 2 students will be doing The Fun Music Co. 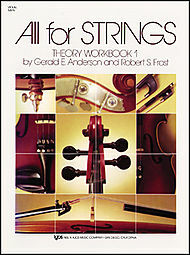 Theory Book 1, Workbook for Strings 1, and Just the Facts 1 (younger student) and 2 (older student). My Book 3 students will be doing Alfred's Essentials 1. 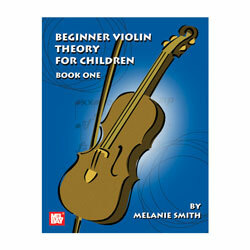 My Book 4 students will be doing Beginner Violin Theory 3, Alfred's Essentials 2, and Notes for Strings 2. My Book 5 students will be doing The Fun Music Co. 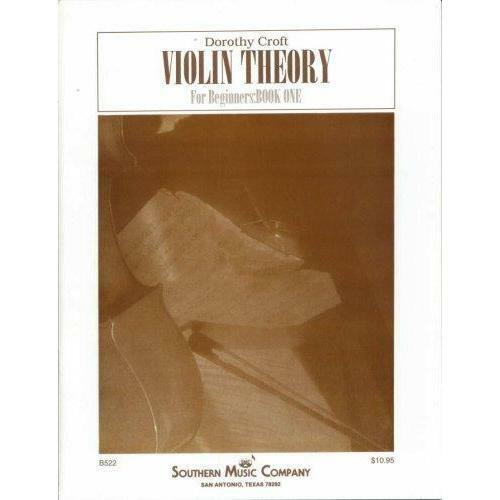 Theory Book 2. And my Book 6 students will be doing Dorothy Crofts Theory Book 1. ...and my Book 2 6-year-old daughter will be doing the Faith Farr book 1 and I will purchase the other supplementary books that I don't have. I really like this one the best and I want to see how it goes with all of the other books. It may be too overwhelming for some families. I'll report back when I see how my students like the books. That's the real test! I'd love to hear your comments about any of these books! I am so excited because I have finally purchased something I've wanted for a long time...a 100 Days of Practicing Club Plaque. These are pretty expensive, but I really believe it will be a great motivator to recognize my students who are consistently practicing. On the plaque are 36 spots for students names who have practicing 100 days (or more) in a row. If they do more than 100 days I make them a new nameplate to replace the existing one with their current number of 100 days (200, 300, 400, etc.) This way they won't feel like they've gotten their reward after only 100....they can keep going! I'm also counting any number of consecutive 100 day practices even if they are not all consecutive with each other. For example, on student might practice 100 days in 2010, then missed some days and decided to start all over again and 2011. The next 100 days will also count (and I will get a 200 day plate) so they can feel like no matter what they can always try again for another 100 days and get recognized for it. Students also get a 100 Days Spirit Stick each time they finish a 100 days to add to their collection. For the students who practice for a whole year I get their own plaque to hang on my wall. I've left some space at the bottom to add consecutive years if they do more than one year. I'm so excited for my students to see their names on my wall. I already have two more students to add to the 100 days club since I made this and I will definitely make a huge deal out of it! Practicing consecutively is awesome! Today is Sunday and our kids don't typically play with friends because it's a family day. However, my 3 year old's best friend lives next door and it's very easy for them to meet and play outside without us knowing. Today was one of those days. When I found her making a "nest" in my front yard out of all of my beautiful daffodils I knew she wouldn't want to come in to practice - but it was time. Well, the other girls saw these games and wanted to play as well. For the older ones I had a blank game board that was laminated. I used a dry-erase marker to write various portions of the practice. 6 year old picked her Japanese Eraser (a panda body with a giraffe head.) She also chose a big green die to roll. My 10 year old had a longer chart because she has much more to practice. Because of this she got to use a 10-sided die. Since this game is a game of chance as to what they will practice some things got skipped and conversely some things were played multiple times. Because of this it wouldn't be an ideal way of practicing all the time, but it sure was fun for a sunny Sunday afternoon. The great things about these game boards is that you can make up your own rules! You can find the music dice for sale here. There are lots of other fun dice for sale here. You can find tons of fun Mini Erasers for sale here. You can download the game boards here. Mom goes out of town...What to do? For those students who are awesome and are trying to work on consecutive daily practice a problem arises when mom (or the practice partner) goes out of town. Here is a fun solution - make a fun practice chart for dad (or whoever is going to take over practicing) that has all of the things that need to be practiced each day. Here are some examples from one of my students. You can download all of these blank charts HERE!